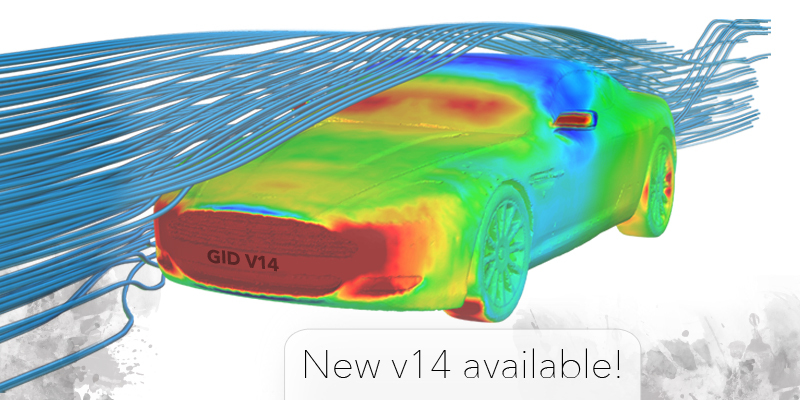 The new GiD14.1.2d developer version version have been released and its ready to download. The new GiD14.1.0d developer version is ready to download for all platforms from our webpage. Background image and textures: now a GIF image can be used. Node limit increased to 10.000 nodes for free version. Graphical fonts can be drawnwith even smoother edges using lcd subpixel rendering on preferences –> fonts panel. Preferences: now preferences are stored inside $HOME/.gid/ folder, these include GiD’s, mesher and problem-type preferences. New import option, to import gidml mesh format (input/output format for GiD Mesh Library). Overlapped labels in preprocess are drawn in RED. Option to enable or disable this feature in the 3rd mouse button menu, under Label. This will help to indenfity geometrical entities which are potentially too close, for instance repeated points, which will be affected by a Geometry –> Collapse operation. Overlapped labels are the ones which share almost the same space coordinates, i.e. within the Automatic (import) tolerance, defined in the Import section of the preferences window. Fixed bug that made GiD crash in some pathological situations with semi-structured volumes and skip entities automatically option set. Fixed bug affecting some models when checking the compatibilities between meshing properties before beginning the meshing process. Planar surfaces store esplicitly the render mesh (previously only a OpenGL drawing list was known), and it is saved in the .rdr render mesh file. Multiple Windows: options moved as sub-menu in the top menu bar, as in preprocess. Graphs labels as in postprocess view. Option to enable multiple line labels, for graphs, vectors and matrix labels. correct calculation of the ‘line variation‘ option, i.e. solved loop problem. Line variation uses the 3D distance of the created graph as abcisses, for instance on non planar surfaces. added option ‘Line projection‘, which uses the 2-clicked-point-line projected distances as abcisses. added ‘2d constraint’ option to the contextual menu of line graphs, so line graphs are created by projecting the created line along the z axis to the surface and discarding the ‘z-coord’ of the surface (for the line variation and line projection options). Polar graphs: now labels in polar graphs are shown where they should be. Selection of polar labels also works now. Logarithmic graphs: corrected problems when drawing and using logarithmic scale and options. Animation of complex vectors: An harmonic animation can be performed for a complex vector when this is used to deform the mesh and the ‘single step animation’ is selected in the Animation Window. After confirming the harmonic animation, the number of steps for this animation will be asked, the deformation factor and the user will be informed that temporary results will be created to perform the animation. When the harmonic animation is stopped or the animation window is closed these temporary results will be deleted and the visualization will go back to the first deformation. Create results window: allow operate with results ‘on gauss points’ with more than 1 gauss point, and efficiency enhanced using objarray objects. Main Matrix results: corrected crash when reading these result types. Deformation on results’ icon bar: now the ‘1x’ button instead of deformation the mesh with factor 1x, asks the user for a new factor. also the scale is adjusted so that for very huge factors (1e+20) factor 1 appears as 1 and not as 0 (due to accuracy error). GiD_Geometry get line|surface <id> render_mesh, to obtain the information of the render mesh of the line or surface. GiD events, updated nomenclature, and now is necessary register our procs to be called when the event happen, with GiD_RegisterEvent <event_name> <procedure> ?<category>? ?<propietary>? A new developer version have been released. GiD13.1.9d is ready to download from our webpage. Fixed bug in unstructured quadrilateral mesher that made GiD crashes in some cases where the surface to mesh had holes. Added some check in octree volume mesher when there are forced points inside volumes, to avoid pathological situations that may lead the program to crash. These pathological situations happens when a forced point suposed to be inside a volume is actually onto some of its contour surfaces. New tcl GiD_Project subcommand GiD_Project view ?clip_planes_x |clip_planes_y| clip_planes_z| clip_planes_margin| rotation_vector| rotation_factor |rotation_matriz| rotation_center| perspective_distance| perspective_ortho_near| perspective_ortho_far| perspective_factor| perspective_view| view_mode| render_mode| ligth_vector? The new official version GiD13.0.3 can be downloaded from www.gidhome.com/download/official-versions/. Check what’s new in this version. Visit www.gidhome.com/download/developer-versions/ and download the latest developer version GiD13.1.8d. Discover the latests news in this version. A new developer version have been released. GiD13.1.7d is ready to download for all platforms from our webpage. The new GiD13.1.6d is ready to download for all platforms from our webpage. macOS: Fixed problems with mouse wheel events in Mac os X.
Labels: Fixed error when drawing labels on nodes. Labels are also drawn in geometry render modes for the visualized entities. Fonts: default quality setting changed to ‘sharp edges’. Also the default fonts are changed to GiD ones. Contour Legends: Now their height can be modified through the preferences window, Preferences–>Postprocess–>Legend options. The height can be adjusted in absolute pixels or relative height %. the setting PostDelaunayCullBigElements is now also in the preferences window. WarnWinText: added contextual menu with options to change the font size of displayed text, switch between proportional or fixed spacing and reset to original font. A new developer version have been released. GiD13.1.5d is ready to download for all platforms from our webpage. Labels: now geometry labels are also drawn in render flat (for lines and surfaces), render smooth (for surfaces) modes and any user/custom defined render modes. Automatic creation of contact surfaces and contact volumes. Undefined results + VBO + Contour Fill: corrected error when drawing nodes without results, they were drawn using the out-of-minimum color, now they are drawn transparent, like with other rendering methods and previous versions. This also applies for result surface extrusion result visualization. Results cache: corrected crash when using relative filenames in batch files and changing the current working directory and using results cache. Contour Ranges: corrected the problem that caused that the text entires in the legend were cut and overdrawn. Legend in external window: solved problem that ignore the current legend format. “Send to new set”: corrected crahs when moving prisms and points to new sets. ChangeMainWindowTitle: new event to capture when GiD changes the main window title.